Last weekend I spent a part of the day taking a new set of photos for our etsy shop of Steve’s soap. Our soap sells well online, but some of the feedback i have received was to improve the photos, make them tell a story. So it seems odd, but i scurried about the house and garden selecting interesting pottery, baskets, picked fresh herbs and flowers, and selected a linen towel for the base… and went about snapping photos. After minor photo shop edits, i posted the new photos up on etsy and we seem to be drawing more attention. The photos show the story… clear label and packaging, a bar unwrapped, and in most cases, an idea of some of the ingredients. I am falling in love with the opportunity to play with my camera, and to tell a story with simple stylizing of the product. I could begin to like this!!!! If you are interested in either of these soaps, click on the picture and you will be taken to our etsy shop. Or just email me, and we can work out the details. 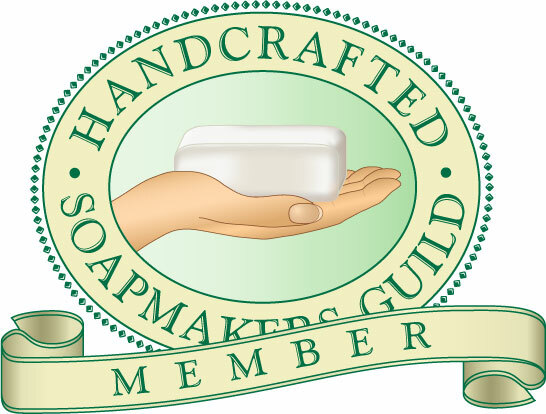 Images in Bloom proudly places the Handcrafted Soapmakers Guild Seal on all of our products. We are members of this professional soapmakers guild. Now you are doing what I do! Implied story telling is the heart of photo styling. These look pretty good, but let me know if you can use some other fabrics or surfaces to shoot on- I can either lend or give you fabrics or props. I can also suggest some other simple set and photography ideas for soap. (I have cheap and easy suggestions for these). I love the natural plant material! Thanks. You are always a source of inspiration. makes me able to almost smell the fragrance…Good Job…love it…. Thanks, and my sympathy on your step dad’s passing.